“Misty” was the radio callsign used by the F-100F Fast Forward Air Controllers (Fast FACs) during the Vietnam War. There were 157 pilots officially assigned to fly missions over North Vietnam from 15 June 1967 – 19 May 1970. 21 other attached pilots flew occasional missions. There were also Intelligence Officers, Flight Surgeons, and Maintenance Officers assigned. It was a small, tight-knit group of special people given a difficult task in a terrible war. Of the 157 Mistys, 34 were shot down (22%). Eight others were shot down when not flying with Misty (total 28%). Two Mistys were shot down twice. There were seven KIA, four POWs, and [as of Jan ’10] 42 are now deceased. There was also one Medal of Honor winner, two Air Force Chiefs of Staff, six general officers, a winner of the Collier Trophy, the Louis Bleriot Medal, the Presidential Citizen’s Medal of Honor, and the first man to fly non-stop, un-refueled around the world. By any measure this was an unusual group of men. Historians have a hard time defining the exact dates of the war in Vietnam. When the Vietnamese defeated the French at the battle of Dien Bien Phu in 1954, Americans began to fill the western power vacuum in an effort to keep Southeast Asia from falling to the Communists. When President Kennedy was elected, he sent advisors; then, sent more advisors, and the U.S. became officially “involved”. 1964 saw the infamous Gulf of Tonkin incident, when, according to President Lyndon Johnson, North Vietnamese torpedo boats attacked an American ship. Congress passed the “Gulf of Tonkin Resolution,” and the President committed U.S. troops. The war started slowly during the “advisory years,” and small-scale actions took place against insurgent Vietcong guerrillas. By the summer of 1965 over 200,000 U.S. troops had been deployed and late in 1965 the first large-scale conflict between U.S. and North Vietnamese troops took place in the Ia Drang Valley, near Pleiku in the central highlands. Also, early in 1965 the President approved the bombing of North Vietnam. The air campaign against North Vietnam became known as “Rolling Thunder”. After Surface to Air Missiles (SAMs) were fired at U.S. aircraft in 1965 west of Hanoi, airstrikes on the north intensified. Between 1965 and 1967, the build-up of U.S. forces continued, and the North Vietnamese attempted to move massive amounts of men and material to the South. Airstrikes were employed against the infiltration routes running south from Hanoi and Haiphong. These routes ran along the coastal plain in the southern part of North Vietnam and through mountain passes into Laos. The air campaign against the infiltration routes in Laos was known as “Steel Tiger”. B-52s flying from Guam and fighters flying from bases in Thailand were employed against roads, bridges, and suspected marshalling areas in the southern panhandle of North Vietnam and in southern Laos and the Demilitarized Zone (DMZ) dividing North and South Vietnam. To prosecute the air war against North Vietnam, planners divided the country into six “Route Packages”. Route Packs 5 and 6 encompassed Hanoi and Haiphong, while Route Pack 1 was the southern panhandle of North Vietnam from just south of Vinh to the DMZ. Route Packs 2, 3, and 4 encompassed the remainder of the country. The Air Force was assigned primary responsibility for Packs 1 and 5, while the U.S. Navy was assigned Packs 2, 3, 4 and 6. Route Pack 6 was later divided into Packs 6A and 6B with the Air Force being given 6A and the Navy 6B. Early in the war propeller-driven FACs in O-1s and O-2s (Slow FACs) were used to control airtsrikes in Route Pack 1, the DMZ and southern Laos. As infiltration rates increased, so did the air defenses, and loses of the Slow FACs increased dramatically – enter the Fast FACs and Misty. A decision was made to employ two-seat F-100F Fast FACs in Route Pack 1 and southern Laos. Misty began with 16 pilots and four aircraft as Detachment 1, 416th Tactical Fighter Squadron, Phu Cat Air Base, Vietnam on 15 June 1967. Its official name was, “The Commado Sabre Operation.” Major George “Bud” Day was the first commander, and the first Ops Officer was Major Bill Douglass. Bud was shot down on 26 August 1967, was captured and remained a POW until February 1973. P.J. White assumed command when Bud was lost. Phu Cat was little more than a runway carved quickly out of the red clay of Binh Dinh province by Army Engineers and contractors. The first Misty pilots designed the basic tactics and techniques used by follow-on Misty generations. Two pilots flew on each mission. The front seat pilot flew the aircraft while the backseater handled the radios and carried maps and a hand-held 35mm camera with telephoto lens. The Misty mission was to interdict men and materials headed to South Vietnam and to prevent SAM deployment in the area of responsibility. A typical Misty mission briefed 2 1/2 hours prior to takeoff. Pilots studied targets and photos supplied by Intel and previous Misty flights, went over the daily “Frag-order” and received intelligence briefings on matters of significance such as aircraft and crews lost the previous day, latest known AAA locations, weather, etc. Pilots “stepped” to the aircraft 45 minutes before takeoff. Aircraft configuration was 2 X 335 gallon fuel tanks; two pods of 2.75″ white phosphorous (Willie Pete) smoke rockets (14 total) and 220 rounds of 20mm ammunition loaded in two 20mm cannons. The flight to North Vietnam from Phu Cat took approximately 30 minutes. Before entering the North, Mistys contacted Airborne Battlefield Command and Control Centers (ABCCCs) such as Hillsboro, Cricket, Moonbeam, etc. They received any updated intelligence, or instructions from HHQ, and proceeded to reconnoiter pre-planned areas and look for moving vehicles and targets of opportunity. If fighters were available, targets were marked and attacked on the first cycle. Then, Misty departed for the first airborne refueling from KC-135 tankers located on refueling tracks (called “Anchors”) over Laos, Thailand, or the Gulf of Tonkin. After refueling, Mistys proceeded back to Pack 1 or Laos, and located and marked targets, controlled fighters against targets sighted during the first cycle, and continued reconnaissance. The Mistys also worked any rescues for downed aircraft, usually capping as on-scene commander until A-1 “Sandys” and HH-53 “Jolly Green” helicopters arrived. In 1967-68 about every third flight turned into a RESCAP. After the second cycle, Mistys generally proceeded home to Phu Cat; however, if lucrative targets were sighted, Misty often returned to the tanker for a third, or even fourth cycle. Missions lasted 4:30 – 6:00 hours. Mistys normally conserved their 20mm ammunition for RESCAPs. Strafing was not encouraged; however, at the end of a mission, Mistys often strafed trucks or POL sighted during the flight. Several aircraft were lost or damaged while strafing. The general tactics employed by early Misty included staying fast – 400-450 knots; continually “jinking” – changing flight path direction every 5-7 seconds (the time of flight for a 37mm round); and staying at 4500′, or above, unless marking targets, participating in a RESCAP, or taking a close look at a particularly important target. Violating any of these rules dramatically increased chances of being shot down; observing them was no guarantee. The majority of North Vietnamese AAA defenses faced by the Mistys included small arms, 50 cal., 14.5mm, 23mm (came later in the war), 37mm, 57mm and occasional 85mm and 100mm AAA guns. In 1968 the North Vietnamese repeatedly attempted to deploy SA-2 SAMs (Surface to Air Missiles) into the area, and later in 1969 the shoulder-fired infrared missile began to proliferate, particularly in Steel Tiger. The NVA confined MIG aircraft to the Hanoi and Haiphong areas. None were encountered by Mistys in the southern Route Packs. By far, the greatest threat to Misty was the 37mm AAA gun. The great majority of Misty loses were attributed to this weapon. Misty was a dangerous mission. The loss rates were high. 34 Mistys (22%) were shot down. For this reason the tour length was adjusted to four months (50-60 missions), after which the pilots returned to complete their tours with a unit flying in South Vietnam. Eight Mistys were shot down while flying other missions, bringing the total loss rate to 28%. The high loss rate was no badge of honor, but was due to the extended time spent over the North and repeated exposure to guns at low altitude. A typical mission entered North Vietnam two-three times and spent two-four hours at low altitude exposed to guns. The single-engine F-100 was particularly vulnerable and drew intense gunfire while marking targets. RESCAPs were extremely hazardous. All stops were pulled out, and rules were set aside to rescue downed pilots. President Johnson declared a bombing moratorium over North Vietnam in November of 1968 in an attempt to bring the North Vietnamese to the peace table. Misty continued to operate over the Ho Chi Minh Trail in Laos. When Phu Cat became an F-4 base, Misty operations were transferred from Phu Cat to Tuy Hoa (the nearest F-100 base) in April 1969. Tony McPeak was the last commander at Phu Cat. From Tuy Hoa, Mistys operated in Steel Tiger (Laos) while F-4 Fast FACs picked-up responsibility for Route Pack 1. Tactics at Tuy Hoa changed and the Mistys operated at lower altitudes and higher speeds. High loss rates continued. 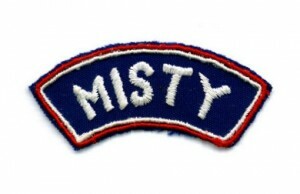 The Misty program was terminated in May of 1970.